As it rapidly develops, the city of Gaziantep expands through the increasing number of settlements in its periphery and the new subway lines connecting them. The mall building is located along a line of public service buildings such as a university and children’s hospital in this developing region. 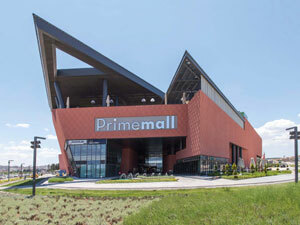 The mall is, in fact, conceived as part of a master plan alongside a housing project in a property owned by the client and located immediately behind the mall building. While the said master plan has not been fully implemented, the project is designed in a manner that provides direct access from the mall to the housing complex. Providing access from various points and levels of the mall to maximize circulation inside the building has been one of the primary objectives of the design. 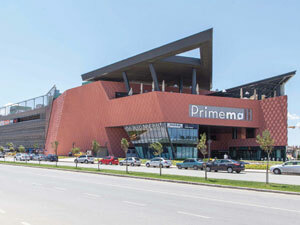 The two entrances in the front facing Necmettin Erbakan Boulevard are monumental in size -in proportion with the building’s scale- and are intentionally designed to be “alluring.” Particularly in the north, the side that coincides with the building’s corner is gradually reduced in size down to human scale. Since the entrance appears massive from afar, cascading the building blocks, creating small streets, and creating an outdoor arcade before entering the mall to downsize it from urban to human scale were among the primary objectives of the design to reverse the overwhelming sense the size of the building yields. Considering that the heaviest flow of mall visitors are from the parking lots, a special design has been created to accommodate the needs of both potential customers and tenants. Apart from the entrance leading straight to the middle of the building and an underground parking lot, the outdoor parking lot in the back with access to the ground floor and the roof parking lot leading to the first floor all provide entry to the mall. This provides a range of possibilities to those visiting the mall by private cars or public transportation and prevents crowding at a single entrance. The entrance of the university side, as well as the northern entrance and the different parking lots facilitate easy and practical visitor entrance. By providing direct access to all levels of the mall, an equal flow of people is generated, thereby facilitating commercial equality on different floors. With the structural design, the uninterrupted perception of the nearly 100-meter main span is created through the elimination of columns. The design, which required 7 to 8-meter interior cantilevers that challenge the structure, allows all the column axes to remain behind the shop-window line. This allows the mall visitors to view upper and lower floors at a maximum level. Apart from the gallery voids in the middle and the intermediate voids, a considerably strong optical association and limitless depth is created on the horizontal level as well. The blind façade created by the introverted morphology of the massive structure gains dynamism through a plastic effect. The project’s geography is highly instrumental in shaping the building shell. The cliffs added to the entrances of the building feature colors and forms that reflect Mesopotamia. Native to Gaziantep cuisine, the highly familiar “baklava” (lozenge) shape is subtly mirrored on the façade of the building. 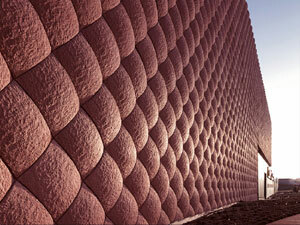 Emphasized by lights illuminating the building, the three-dimensional lozenge texture creates an impressive skin. The colossal cantilever on the third floor and the terrace of the food court adds a rich variety to the alternative places within the mall. The lighting of the cantilever and the flight effect are emphasized as defining points of the project. 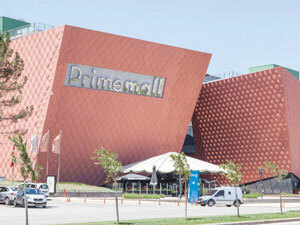 The straight line on the mammoth façade facing Necmettin Erbakan Boulevard is intended as the service corridor. With heating and cooling costs in mind, this unit is kept open and is covered by a metal mesh. The metal mesh is integrated into the building to minimize the undesirable effect of the cacophony of signs often encountered at malls.